For the footballer, see Lawrie Tierney. Lawrence James Tierney (March 15, 1919 – February 26, 2002) was an American actor. Tierney was known for his many screen portrayals of mobsters and tough guys, roles that mirrored his own frequent brushes with the law. In 2005, New York Times critic David Kehr observed that "the hulking Tierney was not so much an actor as a frightening force of nature". Lawrence James Tierney was born in Brooklyn, New York, the son of Mary Alice (nee Crowley) and Lawrence Hugh Tierney. His father was an Irish American policeman. Tierney was a star athlete at Boys' High School, winning awards for track and field and joining Omega Gamma Delta fraternity. He earned an athletic scholarship to Manhattan College but quit after two years to work as a laborer on the New York Aqueduct. He bounced around the country from job to job, working for a time as a catalogue model for Sears Roebuck & Co.
After an acting coach suggested he try the stage, Tierney joined the Black Friars theatre group, moving on to the American-Irish Theatre. He was spotted there in 1943 by an RKO talent scout and given a film contract. Early in his career, Tierney appeared in uncredited roles in films such as Gildersleeve on Broadway (1943), Government Girl (1943), The Ghost Ship (1943) for Val Lewton, The Falcon Out West (1943), Seven Days Ashore (1944) and Youth Runs Wild (1944), also for Lewton. His breakthrough was starring as famous 1930s bank robber John Dillinger in 1945's Dillinger, made for the King Brothers and Monogram Pictures who borrowed from him RKO. Advertised as a tale "written in bullets, blood, and blondes", Dillinger was initially banned in Chicago and other cities where the felon had operated. A low-budget film costing just $60,000 to make, Dillinger nevertheless proved popular, with Tierney being described as "memorably menacing" in the title role. Back at RKO Tierney had support roles in Those Endearing Young Charms (1945), Back to Bataan (1945) (with John Wayne), Mama Loves Papa (1946) and Badman's Territory (1946); he played Jesse James in the latter. As receipts for Dillinger came in, RKO promoted to Tierney with star status in Step by Step (1946), a film noir for RKO, as an ex-Marine falsely accused of murder. He was then a reformed prison inmate in San Quentin (1946). In 1947 he played the lead in two films that have since gained cult followings, a suave but murderous conman in Robert Wise's Born to Kill (1947) and a homicidal hitch-hiker in Felix E. Feist's The Devil Thumbs a Ride (1947). The New York Times' film critic Bosley Crowther condemned Born to Kill as "not only morally disgusting but an offense to a normal intellect." He decried Tierney "as the bold, bad killer whose ambition is to 'fix it so's I can spit in anybody's eye,'" being "given outrageous license to demonstrate the histrionics of nastiness." More recent critics and scholars have viewed the film as a significant film noir and excellent example of RKO's approach to the genre. I resented those pictures they put me in. I never thought of myself as that kind of guy. I thought of myself as a nice guy who wouldn't do rotten things. I hated that character so much but I had to do it for the picture. Tierney had a more sympathetic role as a man wrongly convicted of murder in Richard Fleischer's Bodyguard (1948), based on a story by Robert Altman. RKO also announced they had The Clay Pigeon for him but Bill Williams ended up playing it. Tierney had the lead in Kill or Be Killed (1950) for Eagle Lion, directed by Max Nosseck who did Dillinger. He received fourth billing in Joseph Pevney's Shakedown (1950), then played the lead in another film for Nosseck and Eagle Lion, The Hoodlum (1951). He returned to RKO to play a supporting role reprising Jesse James in Best of the Badmen (1951). He was third billed in The Bushwackers (film)The Bushwhackers (1952). A turn as the villain who caused a train wreck in Cecil B. DeMille's 1952 Best Picture Oscar-winner, The Greatest Show on Earth earned a request by the director of Paramount Pictures to put Tierney under contract, but the idea was dropped when the actor was arrested for fighting in a bar. Tierney had roles in The Man Behind the Badge, The Steel Cage (1954), and Singing in the Dark (1956). He had the lead in the low budget Female Jungle (1956) with Jayne Mansfield but it was little seen. As film offers dried up, Tierney returned to the stage, playing Duke Mantee in a touring version of The Petrified Forest alongside Franchot Tone and Betsy von Furstenberg. He had guest roles in Naked City, The Detectives, New York Confidential, Man with a Camera, Adventures in Paradise, Peter Gunn, The Barbara Stanwyck Show, Follow the Sun, Bus Stop, The Lloyd Bridges Show, and The Alfred Hitchcock Hour. He also guest starred in Seinfeld as Elaine's gruff father, Alton Benes. He continued to get arrested and land in jail for either drunk and disorderly and/or assault and battery charges. Among his film roles were parts in John Cassavetes' A Child Is Waiting (1963), Naked Evil (1966), Custer of the West (1967), and Killer Without a Face (1968). After Child is Waiting he moved to France. After several years of living in France, Tierney returned to New York City, but his troubles with the law continued. In New York, he worked as a bartender and construction worker, and drove a horse-drawn carriage in Central Park. According to the book The Films of John Avildsen: Rocky, The Karate Kid and Other Underdogs, Tierney was supposed to have played the role of Joe Curran in Avildsen's 1970 hit Joe but due to an incident two days before principal photography had begun, when he was arrested for assaulting a bartender who refused to serve him any more liquor, he was fired. He occasionally found film work, appearing in a bit part as a security guard in Otto Preminger's Such Good Friends (1971), in Abduction (1975), in Andy Warhol's Bad in 1976 (which he later described as "a terrible experience—unprofessional"), as well as small roles in Cassavetes' Gloria (1980) and The Prowler (1981). He was also in The Kirlian Witness (1980), Bloodrage (1980), and Arthur (1981). He was second billed in Midnight (1982). Tierney returned to Hollywood in December 1983 and, over the next 12 years, resumed a fairly successful acting career in film and television. He guest-starred on a number of television shows such as Remington Steele, Fame, Hunter, Seinfeld, L.A. Law, Star Trek: The Next Generation, Star Trek: Deep Space Nine, and The Simpsons. In 1984, he appeared in a national campaign of an Excedrin commercial playing a construction worker. In 1985, he had a small speaking role as the chief of the New York City police in John Huston's Prizzi's Honor. From 1985 to 1987, Tierney made a number of guest appearances as Desk Sergeant Jenkins on the night shift on Hill Street Blues, uttering the last line of the series' final episode when he answered the station house's front desk phone, "Hill Street." Tierney had a more substantial supporting role as the father of protagonist Ryan O'Neal in Norman Mailer's film adaptation of his own novel Tough Guys Don't Dance (1987). He also played a baseball-bat wielding bar owner in the film adaptation of Stephen King's Silver Bullet. Tierney credited Tough Guys Don't Dance in particular with rejuvenating his career. In 1988, Tierney played Cyrus Redblock, a tough holodeck gangster in the Star Trek: The Next Generation episode "The Big Goodbye", and in 1991 had a memorable turn by guest starring as Elaine Benes's father Alton Benes in the Seinfeld episode "The Jacket". His performance was brilliant, and they contemplated making him a recurring character. However, when he was caught stealing a knife from the set, and later pulling it on Seinfeld in a threatening fashion, it became clear that he would not be invited back. In 1991, Quentin Tarantino cast him in a supporting role as crime lord Joe Cabot in Reservoir Dogs. The success of the film bookended Tierney's career in playing gangsters. In an homage to his first starring role, Tierney reports that one of his henchmen was "dead as Dillinger". During production, Tierney's off-screen antics both amused and disturbed the cast and crew. Tarantino later claimed that Tierney was very difficult to work with as he would frequently forget his lines. He also stated that he almost got into a fistfight with Tierney at one point. Late in the filming, Tierney began complaining about working in the hot and humid warehouse scenes and took out his attitude on another actor. When Tarantino told Tierney to "tone it down" with his behavior, Tierney directed his anger at Tarantino and physically shoved him in response. Tarantino responded by backing away from Tierney until his anger subsided. Tierney remained in demand as a character actor until he suffered a mild stroke in 1995 which made him gradually slow down his career (he had suffered a previous stroke in 1982). He turned to doing voiceover work on animated features and made occasional appearance in film and television (which most of his appearances feature him only sitting) as his health slowly deteriorated until his death. One of Tierney's last roles was an uncredited cameo appearance as Bruce Willis' invalid father in Armageddon (1998). That same year, his long-term agent, Don Gerler, recounted Tierney's continuing troubles with the law: "A few years back [in 1994] I was still bailing him out of jail. He was 75-years old and still the toughest guy in the bar!" His final acting role was a small part in the 2000 independent film Evicted which was written and directed by his nephew Michael Tierney before retiring from acting altogether. Tierney's numerous arrests for being drunk and disorderly and jail terms for assault on civilians and lawmen alike took a toll on his career. He was an admitted alcoholic who tried to go sober in 1982 after having a mild stroke, once observing during a 1987 interview that he "threw away about seven careers through drink". In just seven years between 1944 and 1951, Tierney was arrested over a dozen times for brawling, frequently for drunkenness. He was jailed for brawling in 1947 and 1949 and drunkenness in 1949 and 1950. His legal troubles included a 90-day jail sentence he served from August to November 1951 for breaking a New York college student's jaw. That year he was also sent to a mental hospital after being found dishevelled in a church. He was arrested for assault in 1953. At the time of an October 1958 arrest for fighting two policemen outside a Manhattan bar, the New York Times reported he had been arrested six times in California and five in New York on similar charges. In January 1973, he was stabbed in a bar fight on the West Side of Manhattan. In June 1975, Tierney was questioned by New York City police in connection with the apparent suicide of a 24-year-old woman who had jumped from the window of her high-rise apartment. Tierney told police, "I had just gotten there, and she just went out the window." He was never formally arrested or charged with the young woman's death. Tierney died of pneumonia at 82, at a Los Angeles nursing home on February 26, 2002, where he had been residing for over two years. He left one daughter, Elizabeth Tierney of Park City, Utah. Tierney's younger brothers were actors Scott Brady, star of the 1959–1961 syndicated western series Shotgun Slade, and Edward Tierney, who subsequently left acting for the construction business. His nephew is film director and actor Michael Tierney. ^ a b c d e "Lawrence Tierney, 82, Actor Known for Tough-Guy Roles". The New York Times. March 2, 2002. Retrieved 2009-01-19. ^ Kehr, David (5 July 2005). "Critic's Choice: New DVD's". The New York Times. Retrieved 2009-01-19. ^ a b c d e f g h i j k l m n o Vallance, Tom (2002-03-01). "Lawrence Tierney (obituary)". The Independent. London. Retrieved 2018-09-23. ^ Lawrence Tierney The Guardian (1959-2003); London (UK) [London (UK)]01 Mar 2002: 26. ^ Of Local Origin New York Times 19 Nov 1943: 25. ^ Mexican Best Seller Cugat Screen Subject: Lawrence Tierney Will Play Dillinger; Bickford Likely 'Doorbells' Costar Schallert, Edwin. Los Angeles Times 4 Oct 1944: 11. ^ STAR OF 'DILLINGER' GETS JAMES ROLE: Lawrence Tierney Listed for 'Bad Man's Territory'--New Mexican Film at Belmont Of Local Origin Special to THE NEW YORK TIMES. New York Times 15 Sep 1945: 21. ^ 'Dillinger' Tierney Gets R.K.O. Stardom Nod Schallert, Edwin. Los Angeles Times 3 May 1945: A3. ^ Crowther, Bosley (May 1, 1947). "Review of Born to Kill". The New York Times. Retrieved 2009-04-04. ^ Silver, Alain; Ward, Elizabeth; Ursini, James (1992). 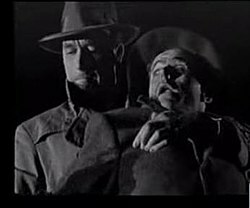 Film noir: an encyclopedic reference to the American style. Woodstock, N.Y.: Overlook Press. p. 40. ISBN 0-87951-479-5. ^ Lawrence Tierney's Career to Bloom Anew Schallert, Edwin. Los Angeles Times 19 Mar 1948: 19. ^ LEATRICE JOY SIGNS FOR ROLE IN MOVIE: Star of Silent Screen Will Play Grandmother in Film Planned by Eagle-Lion By THOMAS F. BRADY Special to THE NEW YORK TIMES. New York Times 18 June 1948: 18. ^ Lawrence Tierney, 82, Actor Known for Tough-Guy Roles: [Obituary (Obit)] New York Times 2 Mar 2002: A.16. ^ Obituaries: Lawrence Tierney Anonymous. Variety; Los Angeles Vol. 386, Iss. 4, (Mar 11-Mar 17, 2002): 51. ^ a b 'Dillinger' has finally wised up Smyth, Mitchell. Toronto Star 6 Dec 1987: D.4. ^ "Lawrence Tierney". The Guardian. London. 2002-03-01. Retrieved 2010-05-07. ^ Child, Ben (2010-01-12). "Why Quentin Tarantino wants to be the next Howard Hawks". The Guardian. Retrieved 2015-03-08. ^ "Actor Held After Afray". The New York Times. 9 October 1951. ^ Tierney Fights Brother; Gets 90 Days in Jail Los Angeles Times 2 May 1947: 2. ^ Lawrence Tierney Jailed in Brawl Los Angeles Times 10 June 1949: 15. ^ Lawrence Tierney, Screen Dillinger, Booked as Drunk Los Angeles Times (1923-1995); Los Angeles, Calif. [Los Angeles, Calif]04 Jan 1949: 2. ^ LAWRENCE TIERNEY CITED ON DRUNK CHARGE Los Angeles Times 15 Oct 1950: B3. ^ "Screen Villain Draws 90 Days". The New York Times. United Press. 30 August 1951. p. 11. Retrieved 2018-03-02. ^ Lawrence Tierney Is Jailed New York Times 4 Aug 1951: 7. ^ Free Lawrence Tierney After Serving 66 Days Chicago Daily Tribune 13 May 1952: a7. ^ Lawrence Tierney Taken to Neurological Hospital Chicago Daily Tribune 9 Oct 1951: 7. ^ LAWRENCE TIERNEY FREED: Court Decides Actor Didn't Hit Pianist With Microphone New York Times 18 Aug 1953: 48. ^ McLellan, Dennis (2002-02-28). "Lawrence Tierney, 82; Actor Was Real-Life Tough Guy". Los Angeles Times. Retrieved 2018-03-02. ^ "Obituary". Associated Press. 2002-03-02. Retrieved 2009-01-26. This page is based on the Wikipedia article Lawrence Tierney; it is used under the Creative Commons Attribution-ShareAlike 3.0 Unported License (CC-BY-SA). You may redistribute it, verbatim or modified, providing that you comply with the terms of the CC-BY-SA.